The camp helped to increase awareness among the participants about volunteerism and the importance of voluntary actions for community mobilization and local development. Vuno, Albania: As part of the tenth anniversary of the International Year of Volunteers (IYV+10), the United Nations Volunteers (UNV) programme in Albania, together with the non-profit organization Projekte Vullnetare Nderkombetare (PVN), organized a volunteer work camp in Vuno, south Albania. During the last two weeks of June 2011, national and international volunteers participated in the camp activities, which aimed to promote environmental protection and Albanian tourism through voluntary work. The volunteers participated in two training sessions on "Volunteerism for development" and "Environmental activities for growing people and plants". They also got involved in activities aiming to address some of the environmental problems faced by the village of Vuno and the city of Himara every year during the summer season. In order to create a clean and welcoming environment for visitors, the volunteers cleaned polluted sites and opened paths for access to coastal areas. They cleaned a path which was covered by vegetation, from Himara city to the coastal village of Livadhe. On their way, the camp leaders and the volunteers chose appropriate spots for the placement of signs indicating the way. They also built cobbled stairs from the main road in Himara to the beach. Moreover, the volunteers interacted with the local community and the tourists in order to raise awareness on environmental issues. The camp activities helped develop capacity in the organization of creative ways to raise awareness on environmental issues among children and youngsters, and shared experiences and positive examples of environmental protection. 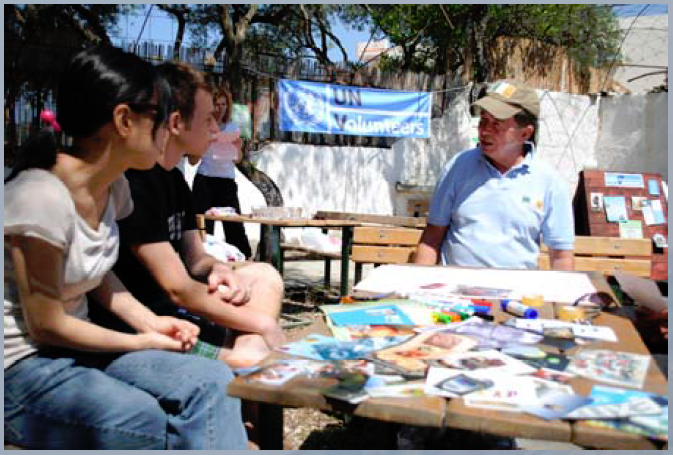 A UNV Albania stand was set up inside the camp, offering information and materials on volunteerism, environmental protection and climate change. Work camp volunteers and participants, other young people and tourists visiting the stand were informed on the work of UNV in Albania and around the world, on opportunities to become a UN Volunteer, and on the different environmental problems currently faced in different parts of Albania. The camp helped to increase awareness among the participants about volunteerism and the importance of voluntary actions for community mobilization and local development, and allowed the participants to share examples of voluntary action carried out in their countries.